2. Wash bell peppers well; trim to remove stems and seeds. Slice stem end from jalapeño peppers; grind remaining jalapeño peppers with seeds. Peel, core and wash onions. Cut peppers and onions into large pieces. Coarsely grind peppers and onions (see Notes at end of procedure). 3. Measure 5 cups of the ground bell peppers with their juice, 5 cups of the ground jalapeño peppers with their juice, and 1-1/2 cups of the ground onion, including juice. 4. Combine the measured peppers and onions with the remaining ingredients into a large stockpot. Bring the mixture to a boil over high heat. Reduce heat and cook at a low boil for 30 minutes, stirring often to prevent scorching. Notes: For recipe development, peppers and onions were ground using a stand mixer grinder attachment with the coarse blade. This is a fairly hot pepper relish. It would be good stirred into cooked greens or beans, or served with cream cheese on crackers. 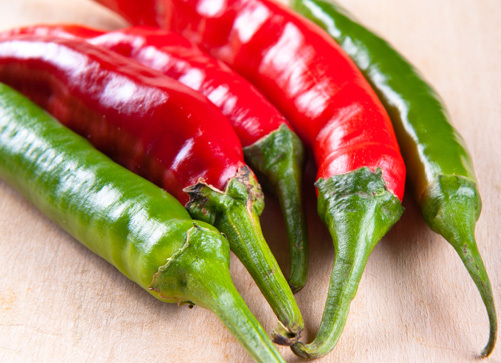 In order to adjust the hot pepper intensity of the finished product, the proportion of sweet to hot peppers may be adjusted according to taste and the variety of hot pepper provided that the total amount of measured ground pepper is not altered. In other words, with all other ingredients measured as specified in the recipe, there should be no more than 10 cups of ground peppers.